Scholars have propounded many theories about the origin of Earth. Though there are lot of differences in opinion of various scientist regarding the age of Earth, yet most of the scientist agree that the life of the Earth may range from 3 to 5 billion years. Let's know abouth the geological history of the earth. Binary star Hypothesis H.N. Rusell The Sun was a binary star twin-star system. It means that the sun had a comapnion star. Supernova Hypothesis F.Hoyle Initially there were two stars in the universe viz. The primitive sun and the comapnion star. The companion star was of giant size and later on became supernova due to explosion. The most popular argument regarding the origin of universe is the Big Bang Theory. It is also called expanding universe hypothesis. Edwin Hubble in 1920 provided evidence that the universe is expanding. Most of the Earth's atmosphere was created in the first one million years after solidification (4.4 billion years ago ). Carbon dioxide, nitrogen, and water vapour dominated this early atmosphere. Geocentric Theory : Geocentric Theory or Ptolemaic Theory says that Earth was located in the centre of Universe and all planets are revolving around it . It was accepted till 1543 A.D.
Heliocentric Theory : Copernicus was the first man who came up with the Heliocentric Theory in 1543 A.D. He scientifically tried to prove it. According to this theory, the sun is in the centre and all the planets including the earth revolves around it. Herschel Theory : Frederick William Herschel a German-born British astronomer constructed his first large telescope in 1774, after which he spent nine years carrying out sky surveys to investigate double stars. The resolving power of the Herschel telescopes revealed that the nebulae in the Messier catalogue were clusters of stars. In the course of an observation on 13 March 1781 he realized that one celestial body he had observed was not a star, but a planet, Uranus which was the first planet to be discovered. According to Herschel our solar system is a part of much larger system i.e, known as Galaxy. Redshift Theory : Redshift happens when light or other electromagnetic radiation from an object is increased in wavelength, or shifted to the red end of the spectrum. The red shift theory gives the evidence that the universe is expanding. Light travels to Earth from other galaxies. As the light from that galaxy gets closer to Earth, the distance between Earth and the galaxy increases, which causes the wavelength of that light to get longer. This is similar to the Doppler effect of sound waves, which also happens with light waves. Star : A star is a luminous sphere of plasma held together by its own gravity. Stars illuminates from it's own energy due to thermonuclear fusion of hydrogen into helium in its core, releasing energy and light. Stellar evolution is the process by which a star changes during its lifetime. Depending on the mass of the star, the lifetime of a star ranges from a few million years for the most massive to trillions of years for the least massive, which is considerably longer than the age of the universe. Stage I (Protostar) : Stellar evolution starts or the birth of a star starts with the gravitational collapse of a giant molecular cloud. As it collapses, a giant molecular cloud breaks into smaller and smaller pieces. In each of these fragments, the collapsing gas releases gravitational potential energy as heat. As the temperature and pressure increase, a fragment condenses into a rotating sphere of superhot gas known as a protostar. Stage II (nuclear fusion ) : Protostars with very less masses never reach temperatures high enough for nuclear fusion of hydrogen to begin such stars are known as brown dwarfs but for massive protostars the core temperature will eventually reach 10 million kelvin which allows proton–proton chain reaction and allowing hydrogen to fuse. first to deuterium and then to helium. Stage III : The onset of nuclear fusion leads to a hydrostatic equilibrium in which energy released by the core exerts a "radiation pressure" balancing the weight of the star's matter, preventing further gravitational collapse. This is the stable state of a star life cycle. Stage IV (Red Giant Stars ) : When hydrogen fuel at the centre of a star is exhausted, nuclear reactions will start move outwards into its atmosphere and burn the hydrogen that’s in a shell surrounding the core due to which the outside of the star starts to expand and cool, turning much redder. Over time, the star will change into a red giant and grow to more than 400 times its original size. While the atmosphere of the star grows, its core shrinks due to gravity. Temperatures and pressures in the middle increase until the conditions are right for nuclear fusion to start again, but this time using helium as a fuel, rather than hydrogen. Stage V (Second Red Giant Stars) : As the star is being powered by helium now so , its outer layers return to normal for a while and it starts to shrink, get hotter and turn a little more blue but, this stage only lasts for a million years or so, as the helium quickly runs out this is the second red giant phase of star. Now after second red giant phase of star the future of star depends onthe mass of the star. Small sun-like stars move into a planetary nebula phase, while stars greater than about 8 times the mass of the Sun are likely to end their days as a supernova. Planetary nebula phase : A planetary nebula is an expanding, glowing shell of hot gas (plasma) it takes small sun-like stars toward the end of life.At the end of it's life low-mass stars turn into planetary nebulae at that point the star becomes highly unstable and starts to pulsate. The outer layers are ejected by the resulting stellar winds. As the outer layers drift away from the star, the remaining core shines brightly and is very hot (100,000°C+) - the core is now a white dwarf star. Over time, the enriched material from the planetary nebula is scattered into space and will be used for future generations of stars. Supernova explosion :Supernova is the explosion of a high-mass star that has come to the end of its life, for a brief time, a supernova can shine as brightly as an entire galaxy, but will fade again over a matter of days. The explosion occurs when a high-mass star finally runs out of nuclear fuel. The resulting shock wave created due to explosion creates an expanding shell of gas and dust called a supernova remnant. After many millions of years, the material in the supernova remnant will be scattered into nearby gas clouds and may eventually be used in the birth of a new star. What remain of the of the star's core becomes a neutron star or a black hole depending on the mass. Neutron Stars : A neutron star is the compact core that remains after a supernova event. When a high-mass star comes to the end of its lifetime, its outer layers collapse onto the core, which compresses the material to a point atoms are smashed apart, leaving only neutrons - sub-atomic particles with no electric charge. Black Holes : Black Holes are formed when very massive stars come to the end of their lifetime, in a supernova event. Everything that remains of the star is crushed down into an small, dense object. Close to the object, gravity is so strong that nothing can get away, not even light. This means that we cannot see anything within that region hence it has been named as the black hole. 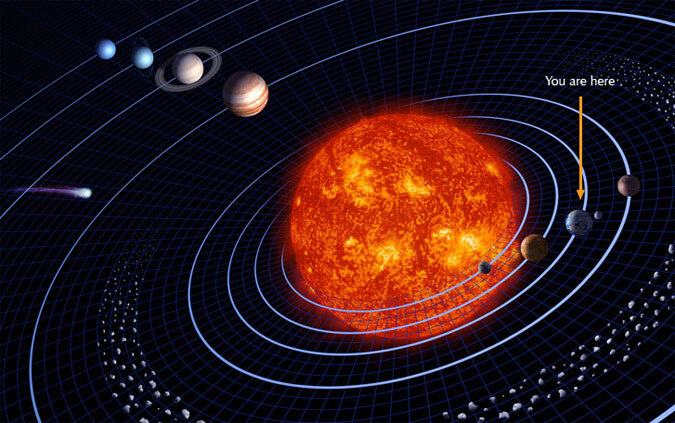 The Solar System comprises the Sun and the planetary system that orbits it, either directly or indirectly which includes eight planets + Satellites + Asteroids + comets +Dwarf Planet. Sun : The Sun is the star at the center of the Solar System. It is the most important source of energy for life on Earth. Its diameter is about 109 times that of Earth, and it has a mass about 330,000 times that of Earth, accounting for about 99.86% of the total mass of the Solar System. Life of Sun : The Sun is roughly middle aged as it has not changed dramatically for four billion years, and will remain fairly stable for another four billion years. However, after hydrogen fusion in its core has stopped, the Sun will undergo severe changes and become a red giant. Corona - Part of sun that we can see. What is Solar Spot and Solar Flare ? Sunspots or Solar spots : Sunspots or Solar spots are temporary phenomena on the photosphere of the Sun that appears dark spots compared to surrounding regions. The occur due to reduced surface temperature caused due to concentrations of magnetic field flux that inhibit convection. Solar Flares : A solar flare is a sudden flash of brightness observed near the Sun's surface. It involves a very broad spectrum of emissions, requiring huige energy. he flare ejects clouds of electrons, ions, and atoms through the corona of the sun into space. These clouds typically reach Earth a day or two after the event and damage satellite communication. Constellation : A constellation is the group of star having a special / define shape and always seen in particular location. Brightest star of our Galaxy : Sirius also known as the "Dog Star", is the brightest star of our Galaxy. Planets according to size (Descending order) : Jupiter, Saturn, Uranus, Neptune, Earth, Venus, Mars and Mercuary.